When I first started in the online world, I struggled to understand how these people were making 6 and 7 figures and still had time to do everything. If you’ve ever looked at another entrepreneur and wondered how she manages to get it all done, the answer might surprise you. It certainly surprised me. While templates will undoubtedly save you time, the real beauty is that once they’re created, you can easily outsource things like email and even sales. Simply instruct your team members on the proper use of your templates, and you’ll be free to do other, more important things. While it's true that good systems are critical to running a high-level business, it does take more than that to run a successful practice. You also need to have the right midset, the ability to delegate, and a clear vision for where you are headed. 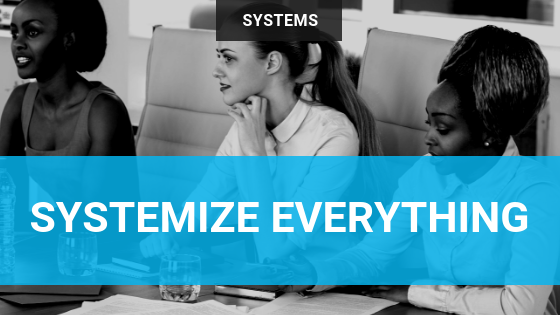 Here at The System Shoppe, we focus on systems because even with all the other pieces in place, your business will not succeed without a structured process that can be easily repeated without your involvement. There are 3 main systems that you should focus on if you're just starting out. Curious? Grab our free ebook 3 Systems That Make Your Business A Little Sweeter.